Many modern seniors love the look and styling ease of a carefree, short gray hairstyle. Short styles range from romantic, soft curls and tousled waves to sleek styles that are sassy and sophisticated. 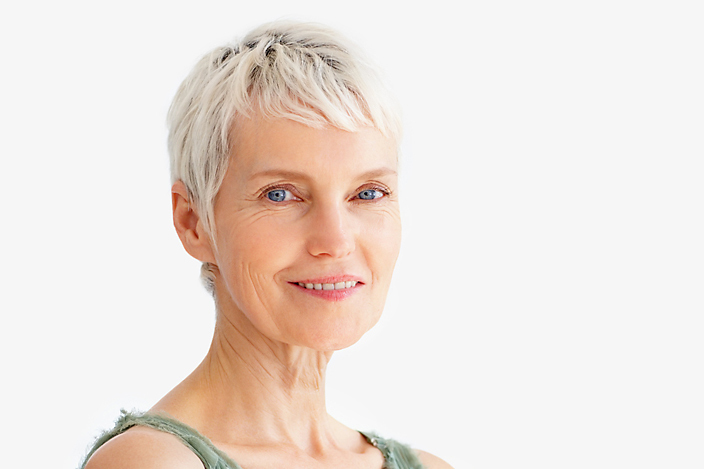 This short cut, with hair brushed forward toward the forehead, is one example of a sleek short haircut for gray hair that is highly popular for mature women. Short layers with a lift are easy short gray haircut to achieve. You need a round styling brush, a blow dryer and a touch of misting hair spray to get this look. Use your styling brush to blow dry your hair, and then set with a fine mist of hair spray, and you're ready to go. Softening the face, classic gentle curls look fabulous at any age. Women who don't have naturally curly hair can get this flattering, easy-to-maintain style from a perm or a body wave. This short cut with long, wispy, uneven bangs draws attention to your beautiful eyes, neck and face. This short haircut for gray hair can also minimize a high forehead. A classic look, the short bob never goes out of style. Long and even bangs can appear too heavy and draw attention to fine lines around the eyes, therefore some mature ladies may want to avoid cutting their hair in this way. This single length style is a great alternative that's easier to style (just use a round brush and a blow dryer). Do you like the idea of a bob, but aren't ready to go super-short yet? Consider a chin-length bob instead of a traditional bob. Making a part on one side of the head instead of in the middle is a nice way to give this classic hairstyle a whole new look. You use the same styling tools and techniques you would with a shorter cut - smoothing serum, round brush, and blow dryer. Short, natural curls are a great wash-and-go style. Not only does this style require very little maintenance, it also goes easily from casual to dressy. If you've spent years trying to tame your curls, stop fighting them. Many women get perms just to have the body that you come by naturally! A versatile style, short layers with a tousled look are easily held in place by applying a small amount of styling product and scrunching your hair in your hands. This low-maintenance style is a great choice for seniors who want a wash-and-wear look that won't have to be cut too often. Highlight your features with short layers that are gently pushed away from your face. A few loose bangs falling onto the forehead add a playful, carefree look. The extra length in the back makes this short hairstyle appear longer, making it a favorite of those who have never had short hair. This is another wash-and-go style, but you may have to use a blow dryer to tame the back from time to time. A look that is both elegant and casual, this gorgeous style is easy to maintain. With short, sideswept layers beautifully framing the face, the uneven part adds to the relaxed look of this hairstyle. It's a great, effortless choice for those with straight hair or locks that have only a slight amount of wave. Cut very short and carefully combed into place, this hairstyle is sophisticated, neat and polished. The side part adds to the beautiful sleek lines of this stylish look. It's easy to care for on a daily basis, but you'll likely need to have trims every three or four weeks to keep this super-short 'do looking super-groomed. Use a light smoothing serum to keep everything in place. This style looks best on very fine, straight hair that isn't exceptionally coarse. A wispy, long bob cut can be a good choice for seniors who have thin hair and who are searching for a low-maintenance hairstyle that looks terrific. Have a few layers added to the traditional long bob style for movement and volume. This cut requires very little attention on a daily basis. You may need smoothing cream or serum and a blowdryer. Bangs are not just for young people! This short style with casual bangs is a lovely choice for mature women. It's a particularly great style for individuals with a round face shape. That's because the unstructured cut of the bangs evens out the facial features, creating a soft overall look. A close crop makes daily maintenance a breeze, and it looks chic, too. This type of short cut will show off your features--and your earring collection! The best part? Aside from frequent haircuts, you don't have to do anything to it in the mornings. It's completely wash-and-go. Because your hair will be so short in this style, any texture will work, though ladies with thicker, coarser hair may love it most. If you want to keep a little bit of length in your hair, flaunt it with curls. Curls are a beautiful way to show variations in color and add a playful vibe to your overall look. Try a soft perm or body wave if your hair isn't naturally curly. The hair tuck isn't just for long locks. Keep a little length and tuck your hair behind your ears for a sporty, energetic look. For the most part, you should be able to air-dry this style with good results. If you want a modern, edgy cut for your hair, look to bangs for the solution. The spikey ones here show how they can soften your features while suggesting you may be a little feisty! Be prepared to use a blowdryer to get this piecey look, and don't forget the texturizing paste on the ends. If the close crop's not your thing but you'd like to try something similar, you can get just that with a short crop. Keep a little height on top while the sides stay close to your head for a soft, feminine cropped 'do that requires almost no attention outside of the occasional trim. Women with curls--natural or permed--may love this one because it's easy to manage, yet still distinctly feminine. This style is a classic for a reason. The bob with bangs works for almost any face shape and any age and it's extremely flattering because it puts your eyes in the spotlight. If you're not into high-maintenance hairstyles, talk to your hairstylist about this cut before you go for it. Depending on your hair type, you may need to manage a round brush and blowdryer to keep this style looking sleek. For another youthful and modern cut, try a bob that's straight and swept to the side or inverted. It's perfect for a professional atmosphere because it has such a polished finish. This style will work best on straight or barely-wavy hair, and be prepared to use a flat iron to smooth it all out to perfection. Mature women no longer have dowdy or matronly hairstyles. Today's senior women sport trendy and classic looks that offer sophistication and a touch of glamour to their looks. Choose a style that's easy-to-maintain and a good fit for your features and you can fall in love with your look all over again.